The prospect of how students will engage and navigate their campus lives in the next few years is intriguing. 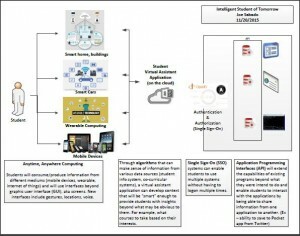 The general availability of consumer technologies (social media, cloud, mobile, internet of things wearable computing) coupled with advances in enterprise computing practices (big data and algorithms, security, artificial intelligence (bots), application programming interfaces) can lead to students using technology in new ways we may not have even seen. The image below shows how different technologies can work together for students’ benefits. While I titled it “Intelligent Students of Tomorrow”, the reality is that “tomorrow” is now the present but the scenario presented in the diagram will become more common. What’s your vision of tomorrow and how students will use technology? 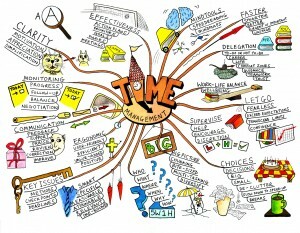 This is a post on mind mapping, a technique used to visually organize ideas, tasks and any set of related information. This is a concept popularized by Tony Buzan, who is also the founder of the World Memory Championship and a memory champion himself. I will share a couple of ways I use this technique, some applications I use, and how I am able to work on my ideas from my mobile devices, laptops, and desktops at work and at home. It really is such a simple concept and only requires couple of applications to use. Even just a notepad will do. iThoughts on iphone and iPad. I found this application to be the easiest to use in terms of the user interface and functionality. One of the features I really like is the cloud integration with itunes, Box and Dropbox services. This is very useful when I work on my ideas on multiple devices. Another useful feature is the ability to export/import diagrams using various industry formats like OPML, CSV, html and Freemind’s format. Evernote. While I do most of my mind mapping on my computers, I still use paper from time to time. When ideas strike me and I only have my notepad, I write my thoughts immediately. I then take a picture of my notes and upload them to evernote into notebooks I organize by themes/ideas. Freemind.This a free software that runs on Windows, Mac and Linux. Dropbox. As I previously mentioned, this is where I upload/download and share the mind map documents I generate from iThoughts and Freemind. Notepad. It’s not digital, but still effective. As you can see, there is not too much when it comes to mind mapping, but it is a technique that is very powerful and effective when it comes to generating and documenting ideas. 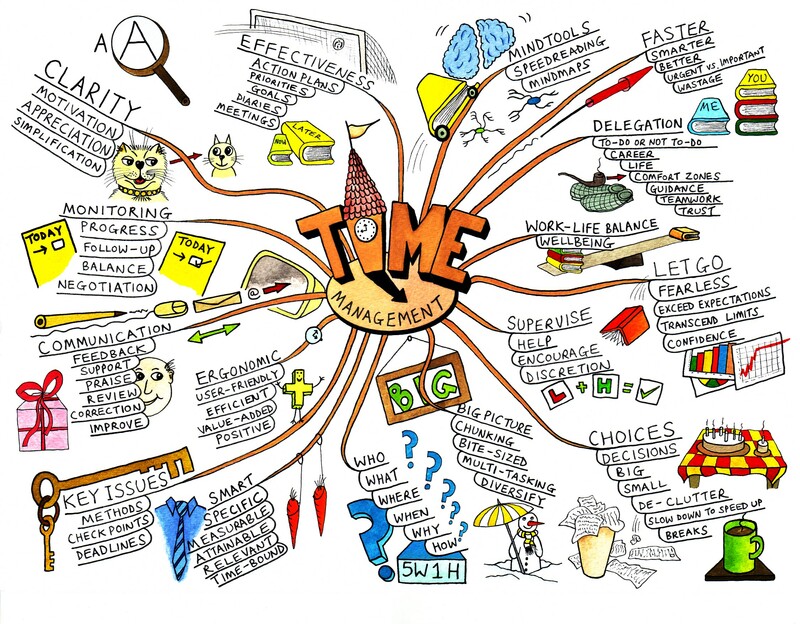 Happy mind mapping! My wife and I were having dinner with a teenage daughter of a friend recently. She mentioned that she has been trying to convince her parents to buy her an iphone so she can do some school work. In the past, I would have dismissed the idea that an iphone or any mobile device could be used for nothing more than texting and wasting time. However, given my personal experience the last couple of years using my iphone, ipad and just recently my chromebook, I see the value of using mobile devices for learning. Here are some applications and ways I use my mobile devices (and you could, too) for professional development. Social media mobile apps. I have several social media apps on my iphone including: facebook, twitter, pinterest, foursquare, google+, tweetcaster, yammer, skype, linkedin and a few others. While I do have these installed, I mainly use facebook and twitter. Personally, twitter has become my “go-to” network for learning and connecting with others. Social bookmarking. Diigo, a social bookmarking site provides a bookmarklet you can use to bookmark pages you find on the web. This bookmarklet provides tagging functionality to organize bookmarks. In my case, I use a combination of diigo.com and rss to curate some content on to this blog under the resources section. This is done with minimal manual process. For a fee, my twitter favorites are copied to diigo.com daily. Here are my bookmarks. Kindle app. I use this app to read digital books I buy and download from Amazon. For some reason, the Amazon mobile app does not have the functionality to buy kindle books so I use their mobile website. I also use the kindle app to read pdfs. I find the highlight and sharing functionality really useful. Podcasts/Videos. The TED videos are perfect examples of how I maximize my time during the workday to learn. The videos are short (approx max of 20 mins) and so I sometime listen to them when walking from/to different locations on campus for meetings. Goodreads. This is a site used by readers to catalog and share the books they read. The value of the site for me is that I can share what I read and I can also view what other folks in my profession (student affairs) are reading. This gives me some ideas on what books I should be reading. Here is my list of books. G-Whizz! (Google Apps browser). This app provides access to Google+, gmail, google drive and other google apps. I use this app primarily as my RSS reader. I use Google Alerts to monitor keywords like “student affairs”, “social business” and I have set it up for these notifications to be pushed to my gmail account. Blogging. With my new chromebook, I have been able to blog from a device other than my laptop at home, which I use as my desktop machine. Maybe it’s just personal preference, but even with a keyboard, I didn’t feel comfortable using my ipad to log in to wordpress (software I use for this blog site) administrative interface. Slideshare. This is a good site to view presentations, including ones that have been converted from powerpoint formats. It is also a good site to share your personal presentations. Here are some of mine. Cloud Storage. There are several cloud storage options including Dropbox, Google Drive, and Microsoft Skydrive. I mostly use dropbox because of its automatic synching capability. I only store documents and presentations that I consider public. These include presentations I am working on and any pdf files and other presentations I find when doing research. Mindmapping. I use a mindmapping app called iThoughtsHD on my ipad to organize my presentations and to brainstorm ideas. I find the mindmapping process really productive when I’m just casually watching tv or when inspirations about new ideas enter my mind. Virtual Conferencing. I have used Skype on my iphone for informational interviews. I have also used Adobe Connect for a virtual meeting. Google+ mobile for Hangouts is another app to consider. What other uses for professional development have you found for your mobile devices?